Red and White script in small diamond, along stringer on nose. Red and White script in diamond, large at wide point. Image below. Blue script and graphic on tail. Image left. Red and White script in large diamond, along stringer on nose. Black at wide point. Image bottom. 3. Bare Nature and address. Black and white script centred at channels. Image above left. Deck: 6' 10'' x 21 1/4'' . Pencil along stringer near the tail. Bottom: WR '86. Pencil along stringer between fins. Deck: Clear with sprayed pink rail lap and sprayed dark red pinlines. Note not around tail. 1. Stock Board. Purchased 18 May??? 1986. Bare Nature Surfboards,15 Browning Street, Byron Bay NSW. Trade-in john McInnes' Huzza-Wuzza Surfboards Mini Mal by Richard Herbert ? Image right : Bare Nature Stringerless Tracker (?) 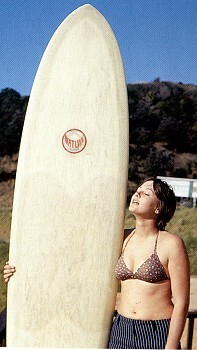 approximately + 8 ft with round label and Theresa McTavish, 1968. Innermost Limits of Pure Fun, 1970. Part 1. Australian Surfer's Journal, Vol 2 Number 2, Autumn 1999, page 102. 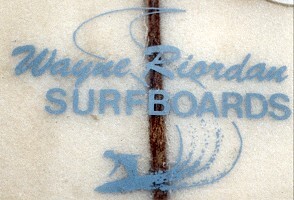 Apparently short lived as all were involved with Wilderness Surfboards, Byron Bay by 1969. - a black on clear graphic of Broken Head. 1979 - 15 Browning Street, Byron Bay. Phone : (068) 85 6720. "Pintail and roundtail wingers. 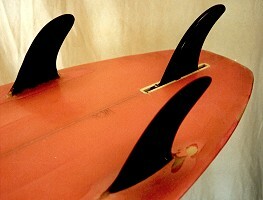 Single fins only." Tracks magazine, December 1979, page 44. Signed Ken Del Rio 76 ?? ?